The KU Department of Civil, Environmental and Architectural Engineering will offer 7 two-hour presentations on topics of interest to practicing engineers. This series will be presented on Mondays, 4-6 p.m., January 21st through March 4th , at Burns & McDonnell World Headquarters, 9450 Ward Parkway in Kansas City. Participants will earn 2.0 hours of PDH credit for each session attended. By design, most reservoirs fill with sediment as they age. We are now realizing that this strategy to “trap and store” sediment leads to costly O&M problems and a loss of crucial reservoir functions and benefits. Yet traditional dredging with land disposal is so expensive as to be out of reach for local, state, and even federal governments. This session will present case studies for new, cost-effective sediment removal techniques for both acute and chronic sediment problems. John Shelley is a Hydraulic Engineer with the U.S, Army Corps of Engineers. This course offers an up-tempo talk about how to navigate through your professional career while maintaining your obligation to protect the health, safety, and welfare of the public. A non-boring review of codes of ethics will be provided, and many thought-provoking case studies (large and small!) will be discussed. Steve Schrock is a professor at the University of Kansas in the CEAE Department. Elaina Sutley completed the third consecutive field study following the impact and recovery cycle of Lumberton, North Carolina after Hurricanes Matthew and Florence. Dr. Sutley is a researcher in the NIST-funded Center for Risk-Based Community Resilience Planning, and holds leadership positions on national-level ASCE, SEI, and NSF committees. Dr. Sutley is an assistant professor in structural engineering at the University of Kansas. Dr. Sutley was recently awarded two National Science Foundation projects, including one on improving the seismic resilience of building structures in Nepal, and the other supporting post-disaster field reconnaissance in the Florida panhandle after Hurricane Michael. This lecture is a two part series. Part 1 - Outline how the government, through environmental regulations, impact a public utility’s budget and schedule. The lecture will primarily focus on regulation which impact utilities that discharge wastewater directly to streams/lakes of the U.S. Part 2 – Review how those same regulations resulted in the evolution of the City of Kansas City, MO Smart Sewer program. Discuss the design and construction challenges during implementation of one of the City’s projects involving sewer separation of an existing combined sewer. David Poirier is a Project Engineer at TetraTech in Kansas City, MO. This presentation will focus on project risks encountered by the project stakeholders and tools that are used to mitigate them. Project risk identification and analysis; contracting methods; subcontractor evaluation & default risks; site logistics concerns; Building Information Modelling & 3D scanning, and project scheduling methods will all be discussed. Josh Cindrell is Vice President of Construction for Alberici Constructors, and is currently serving as the VP of Operations for CAS Constructors. Throughout his career he has worked on a wide variety of projects in the United States and Canada including: Professional Football & Baseball Stadiums, Convention Centers, Heavy Industrial Manufacturing Facilities, Nuclear Power Facilities, Wastewater Treatment Plants and a wide variety of commercial facilities. The use of 2D hydraulic modeling and Computational Fluid Dynamics (CFD) is becoming more widespread in engineering practice with the availability of better commercially available software packages and substantial increases in personal computer’s computational power. This presentation will provide a brief technical description of 2D and CFD modeling, and will showcase how 2D and CFD hydraulic modeling can be used to solve practical and regulatory problems. Case studies ranging from flood mapping using 2D modeling to high-end hydraulic modeling of a turbine using CFD. Pablo Gonzalez-Quesada is a Senior Water Resources Engineer at Black & Veatch Corporation. Recent research and design developments in structural concrete have prompted new and revised code requirements for the next building code update. The impacts of upcoming changes are explained through design examples. Challenges associated with allowing the use of high-strength reinforcing bars, with yield strength greater than 80 ksi, are also discussed. Andres Lepage is an associate professor in the KU Department of Civil, Environmental and Architectural Engineering. Tickets are transferrable among participants and sessions; please inform Susan Scott of changes prior to the session. Classes will meet in the Burns & McDonnell Auditorium. 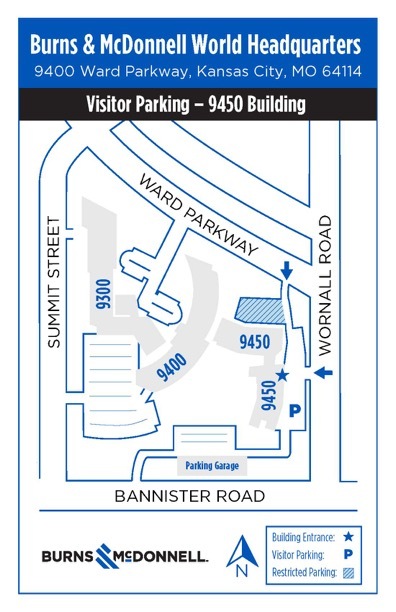 Please park in the visitors’ lot at 9450 Ward Parkway (facing Wornall Rd.) Lot (see map below). Visitors enter through main entrance to 9450 to reception area.